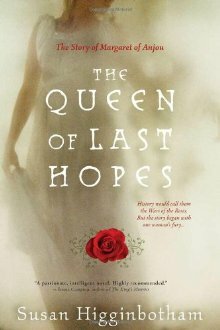 This novel about little-known Margaret of Anjou is written from the viewpoint of several narrators. In essence, it describes in great detail the beginning of what history has termed “the Wars of the Roses,” that is, the incessant fighting that occurred between two aspirants to the throne of England, the House of Lancaster and the House of York. The events take place during the years 1444 through 1482. It begins with the marriage of 15-year-old passionate, proud, strong-willed Margaret of Anjou to Henry VI of England of the House of Lancaster. He is a gentle, sweet, somewhat ineffective king, more interested in religion than military matters. By the time they marry his mental state is unstable and by the time their only son is born Henry suffers a complete breakdown. Rumors and innuendo swirl around Margaret because it is believed that the king is unable to father children. Margaret fails to gain the love and respect of the people. When the king is deposed, and the rival Yolkiest takes the throne, Margaret fights to maintain the English crown for her son. Betrayals, horrible deaths of supporters, deeply-felt losses all contribute to the eventual decline and defeat of the House of Lancaster. When her husband dies in the Tower (was he murdered?) and their son dies in battle, Margaret is broken in spirit. Her aspirations for her son come to nothing in the end. She lives out her days in France and is buried there. It was somewhat difficult to follow all of the names of people in the novel, many of whom had names and titles that differed. I had to keep referring back to the beginning of the book where the various players are listed. This novel is very fast-moving and detailed. Good insight is given into the life of this strong French woman who became a Queen of England. Historical novel fans will enjoy this book. Disclosure: Thanks to Sourcebooks for sending me this book as a gift. I was not compensated in any other way, nor told how to rate or review this product. Sandra, this does sound like a good read for historical fans. I have several friends who would love this book! I read this one and really enjoyed it. I agree with the names, but that tends to happen often in historical fiction novels. This time period seems to make for very interesting reading. Margaret doesn't seem like she had a very happy life. The cover on this book is stunning! Something about it really draws me in. I've never read anything from this time period that I can remember. I'm not big on books with lots of characters or similar names. It's too hard to follow them. This one sounds great (I sometimes have the same problem remembering who's who, so having the characters listed helps a lot) Thanks for the review! This sounds really good. I've read about her only as a "supporting character" not as the main one before. I just watched The Tudors, so this book appeals to me. It would give me some of the backstory!